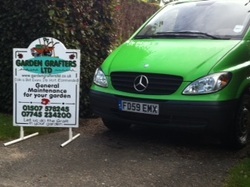 Garden Grafters has been in business since 2001 and is made up of Colin & Bet Evans, a caring husband and wife team carrying out general maintenance in and around the area of Horncastle and Woodhall Spa. Colin has many years experience, previously working in a well known, local nursery for over 22 years. Bet worked for the same nursery as a garden centre sales assistant and florist. We pride ourselves on our work and aim to look after the gardens of others as we do our own. And neaten your lawn edges. In the Autumn cut your hedges. No small job we'll reject. Without any hassle or fuss. You should be coming to us"
Feel free to browse our web-site and the services we offer. We look forward to receiving your call or email to discuss your gardening needs.